Thomas Gilbert “Hamish” Mahaddie DSO DFC AFC joined the RAF in 1928, serving in Egypt & Iraq during the 1930’s. Returning to the UK in 1937 as an experienced Pilot, he found himself in an Air Force preparing for the inevitable Outbreak of War. Hamish flew 2 Tours of Operations with Bomber Command, the 1st in the Twin-Engined Whitley and the 2nd in the huge 4-Engined Stirling. He went on to become a founding Member of Air Vice Marshall Don Bennett’s Staff at Pathfinder Force Headquarters where he was appointed Group Training Inspector, responsible for the supply of Crews for the Pathfinders. Following his Retirement from the RAF in 1958, he became an Aviation Consultant. In 1989 his Autobiography “Hamish, The Story of a Pathfinder” was published. The Nanton Lancaster Society was honoured by his presence at the dedication of the Ian Bazalgette Memorial Lancaster in 1990. Having risen through the Ranks to Group Captain he was eventually taken off Operational Flying in March 1943 and given the Task of Recruiting Aircrew for the Pathfinder Force and was later was CO of RAF Warboys. Skipper W/Cmdr T G (Hamish) Mahaddie DSO, DFC, AFC, CzMC. W/Op F/Off I J (Eddie) Edwards DFM. M/Upper Gun F/Sgt. R C (Bob) Pointer DFM. Rear/Gun F/Sgt. A (Alec) Clift DFM. This was to be F/Sgt R C Pointers 45th Bombing Operation, after which Aircrew members on Pathfinder Squadrons were rested, it was therefore with a little trepidation that he approached this evening’s trip. For reasons best known to themselves, the powers that be had decided that, because of the lack of height attained by Stirling over the Target, all Armoured Plating, except for that shielding the Pilot & the Flare Chute, should be removed. This included the rather large piece behind the Wireless Operator, which protected him and the Radio Equipment, but also the small piece that formed the Seat of the Mid-upper Turret, which was replaced by a canvas sling. It was a cold but dry February afternoon with some cloud as we trooped into the Operations. room for the Briefing. The Station Commander welcomed us as usual and gave us the news that tonight’s Target was Cologne. There on the large map behind him was the Black Tape with its Dog-legs to the Target & Back, the Met Officer with his usual-(some cloud cover en-route, but Clearing over the Target), then the instructions from the various Leaders. We gathered our flying rations [which contained a can of orange juice, a small bar of chocolate, a small packet of plain biscuits and a few barley sugars] then the NCO’s amongst us made our way to the YMCA Hut, where the people in charge always filled our flasks [it tasted better than the Coffee that they dished up in the Sergeants Mess]. From there we went to the Crew room in the Hangar to get kitted up in the Electrically wired Inner Suit and the Leather Outer Suit, Mae West & Parachute Harness, picked up our Parachutes and boarded the Crew Bus to take us to Stirling ‘C’ for Charlie standing in line on the Perimeter Track, at the South Western end of the Main Runway. They were certainly a magnificent sight, a dozen Large Aircraft in a curve around the edge of the Airfield, a small knot of men clustered about each Giant Stirling, quite subdued talk coming from them as they completed their various tasks. We climbed aboard and stowed our chutes & rations in their respective places, next we checked our own equipment, in my case cocking my guns a couple of times to make sure they worked smoothly, the Rear Gunner fired a short burst into the Ground at the rear of the Aircraft. With everything looking OK we left the Aircraft for a last stretch and if necessary relieved our bladders under the Tailplane, (as was our usual practice), I gave my pack of biscuits to the Flight Engineer [superstition] and we then got back on board. One by one the Hercules Engines roared into life, the Aircraft now belonged to the Skipper & the Engineer. The rest of us tended to our own duties, for my part the testing of the Turret and the Gun release mechanism, with the guns on safe. The Skipper called each position over the intercom in turn, and we were ready to take our place on the end of the Runway. It was our turn next, a Green light from the Aldis Lamp and we were away. Bags of chat between the Skipper & Jock the Engineer – rich mixture, flaps, full power etc, then under-carriage up, course Setting from the Navigator, we were off – time 19.15 hours. We were over the North Sea by then, eyes were accustomed to the darkness and from Alec the Rear Gunner the request (permission to Test the Guns Skipper) on the affirmative we both gave a short burst, we were on the alert from then on. More thoughts as we flew out over the sea – I wondered how Joan [my ex -WAAF M/T driver wife] was this evening, she was 5 months pregnant and living with my parents in North Bucks, maybe I’d get some leave after this Operation to see her. Enemy Coast Ahead, there were a few searchlights sweeping the Night Sky and the occasional Flak Burst. As we were among the 1st Aircraft in the Bomber Stream there was not a lot of opposition at 1st, but it got heavier as we crossed the Coast. A new Heading from the Navigator, the Skipper turned to the new Course and started a gentle weave, there was a certain amount of cloud cover, for which we were thankful, we had dodged the Searchlights so far, others were not so lucky and were having a hectic time. The Navigator gave the final course correction to take us into the Target. As we approached some of the early Birds were already there, the Flak & Searchlights had increased and the cloud cover had decreased, [proving the Met Officer correct,] the Skipper increased his weaving & the Bomb Aimer, Len left his front Turret ready to drop our Marker Flares & Bombs, in the mid-upper turret I had now to cover the front of the Aircraft as well, doing a 360° Search for Enemy Night Fighters. The Bomb Aimer now gave his instructions to the Skipper and we were flying Straight & Level with the Target coming up in the Bomb-sights. Bomb Doors open – with a left, left, steady, right, steady – – Bombs Gone. The Aircraft gave a lurch upwards, from the Bomb Aimer came – hold it steady for the Flash Bomb Photo. Suddenly there was an almighty explosion as a Flak Shell Burst on our Starboard side, at the same time there was the sound of Cannon Shells ripping through the fuselage and the smell of burnt Cordite filled the Plane. I felt a sharp pain in my right buttock, as if a knife had been stuck in me, my first thought was – this is it, so much for the Canvas Seat. The Turret went dead, the Hydraulic Pipes giving me Power had been shot through. I tried to speak over the Intercom but this was dead also. The Aircraft went into a Dive and my 1st reaction was to get out. As no instructions could be given over the Intercom and my turret being U/s, I got down from my seat to find out what was happening. The inside of the Aircraft glowed like a Christmas Tree, there were Green spots everywhere, I presumed them to be some sort of Phosphorus. As the Aircraft had come to a more even keel I went towards the Rear Turret to see if Alex was OK, he appeared to be moving his Turret by hand, so I assumed he wasn’t injured. Looking forward I could see several large holes in the Starboard side, then I noticed a torch being flashed amidships, making my way towards this light, I found the Engineer at work, repairing the Aileron Controls with pieces of Wire which he had conjured up from somewhere, going on into the Wireless Cabin, I found that Eddie, (our Wireless Op. for the night ) had been badly injured in the hand, a Cannon shell had Ripped open the sleeve of his Flying Jacket, and severed the 2 middle fingers of his right hand and gone into the W/T set wrecking it. He was tuning in to the 9 o’clock News from the BBC, if his hand had been lower he wouldn’t have been hit. The time was 20.59. There was a 1st aid pad on by then, I gave him a Shot of Morphine and put a tourniquet on it, by then another member of the Crew came back and relieved me, I then went back to my Turret and kept Watch, trying to work my Guns Manually, which proved to be next to impossible, Luckily we were not attacked again. Meanwhile, the Skipper was fighting the Aircraft ( having had the Aileron controls badly mangled by the Cannon Shells he could only fly the Aircraft by varying the Power of the Engines,) Jock, our Engineer, clambering in the Wing Root with his pieces of wire, the Skipper managed to gain partial control of ‘C‘ Charlie and set course for home. With all special equipment U/s, Tommy, our Navigator, guided us with the Astro Compass, and did such good work that we broke cloud over Waterbeach, just 5 miles from Base, on our Home Circuit. Never was I so pleased to see the homing Searchlight that invariably shone over Oakington. By word of mouth, we received orders to take up Crash Positions, and a Red Distress Cartridge was fired. Alec Clift and I sat with our backs to the Bulkhead facing Aft, and just before Touchdown put our hands behind our Heads, my hands felt all wet and sticky, having banged my head a few times during the return flight, I wondered what on earth had happened. The Skipper made a very good landing and the Emergency Crews raced up to us as we Taxied to a halt. Alex shone his torch on my hands & head, the sticky liquid, although Red in colour, turned out to be Tomato Juice, it had dripped from the Dinghy pack stowed above my head, which had been punctured by the Shrapnel. As soon as we had rolled to a stop and climbed down, the first thing I did was to kiss the ground, the 45th Operation was over. The injured W/Op Eddie was taken away by Ambulance, the rest of were taken for Debriefing. When I reported the sharp pain in my rear, the Medical Officer had my trousers down, I was given an injection and shipped off to Ely Hospital for X-rays. It was found that a small piece of shrapnel was embedded in my right buttock, but it was left there, and I was told it would work itself out; to this day it has never done so. In the cold light of day, the Aircraft looked a sorry Mess, the H2S Cupola & Scanning Gear had been shot away, and according to what the Ground Crew told the Skipper, there were 174 Cannon Shell hits on the Fuselage & Wings. One of the rear wheels was Punctured and there were one or 2 large Holes from a Flak Burst. I still have in my possession a 20mm Cannon Shell, that buried itself in the Skipper’s Seat Parachute … Hamish was a very lucky man that night, as indeed we all were. That was my last Trip; the Skipper was whisked away to Pathfinder HQ to be Chief Poacher for AVM Don Bennett. We were replaced by Sqdn Ldr M E Thwaites DFC as Pilot and F/Sgt R M Urwin as Mid-upper Gunner. They were sadly all killed in action on their 1st Op together on 12th March 1943. Target Stuttgart, Bomb load 3 X 2000 lb HC Take Off `19.29 hrs. They are all buried in the Minaucourt Communal Cemetery, France. Aircrew returning from a Reconnaissance & Leaflet dropping Mission. Berkeley Denis Cayford is on the far left. Second from the right, with the full-length coat, is Thomas Gilbert Mahaddie (“Hamish” Mahaddie). He was born Leith, in Scotland in 1911 and joined the Royal Air Force in 1928. Tension & Fatigue of returning from an Operational Mission – but also the relief to be back home safely – is visible on the Crew members’ faces. As “Group Training Inspector,” ‘Hamish’ regularly visited Operational Squadrons, giving Lectures to 400 or more Aircrew on the changing Tactics & Techniques employed by the Pathfinders. Before visiting a Station, Hamish would have already identified Crews that he felt were Candidates for the PFF by studying Aiming Point photographs that indicated which Crews were dropping their Bombs Accurately on the Targets. During an Interview in Nanton, Lancaster Society, Canada, Hamish recalled, “This was a Pretext, that was to get in and to see the guys who I had Identified. Generally, I met these people, Individually & Privately, in the Pub that evening. Then, if a Pilot & Crew wished to apply to be transferred to the PFF, they would have to put in a Written Application to the Squadron Commander. What would then happen would be that the Squadron Commander would look at it and say, ‘Not fair! He’s too good!‘ and then tear it up and put it in the trash-can. Then the Guy would put in another one and the same thing would happen. But the next time I was around, the Guy would make quite certain that he bought me a ½-pint at the local Boozer down the street that same day. He’d say, ‘Look, what gives? 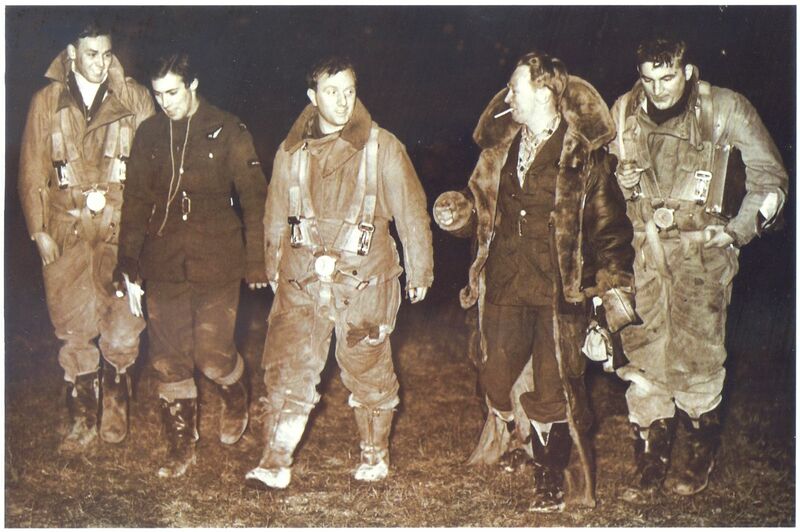 I’ve put in 2 Applications and the Boss just tears them up.‘ I’d take his name and his Crew would then be Posted & 48 hrs later he’d be down at Warboys and starting his Training as a Pathfinder.” Through this, and other Techniques, Mahaddie recruited 1000’s of the most highly regarded Bomber Command Aircrew to the Pathfinders, including Ian Bazalgette VC DFC. Sir: I understand from my telephone conversation yesterday with Flt. Lt. Rogers that Air Cdre. Kirkpatrick of No.3 Group requested that the PFF should not claim me, as there was a ‘Special Job’ for which I was required. No.115 Squadron has informed me by letter that I am posted to Lossiemouth on a routine exchange for a Flight Commander from that Station, with effect from the 1st September. The actual position, as I see it (and writing very unofficially), is that No.3 Group cannot obtain the particular replacement for me they require without offering me in Exchange. The upshot is that my application for the PFF is quietly squashed whilst I am on leave on the grounds of a ‘Special Job.’ The only work that I have heard of is either an OTU or a Stirling Conversion Unit. The real point is where can I be of the greatest Value, and I am convinced that a PFF Tour does more good than a Flight Commander’s job at an OTU. My personal angle is that anyone missing Ops this autumn and winter has “had it.” I entreat you to rescue me before the 1st September if I can be of use to PFF. Again, I must apologise for bothering you with my Personal Affairs, but the incentive is very strong. Dear Wing Commander Mahaddie: A pathetic appeal from the frozen north – my 6 months OTU Tour expires at the end of this month and I must get to 8 Group at once. I feel that if I cannot break away now, I have “had” my 2nd Tour. It is my dearest wish to have another Personal Affair with Germany, before we deal with the Yellow Jobs (Japanese). This all reads like a line, but believe me, I am very sincere. The main essential, as far as I can see it, is to have it organised as an Exchange Posting and to insist on the 6-month Ruling being adhered to. If there is any question of it being to my advantage to stay here (you will remember the No.3 Group Story) please disregard it. A few keen Types scattered around the Group are anxious to get back with me. In case there is any hope, I enclose a separate list of their names & categories. There is one point, Sir, on which we urgently need your advice – shall we all put in Official Applications through our various Units, or keep quiet and leave it all to you? Hamish emotionally Lamented the deaths of so many 1,000s of the Pathfinders that he had personally Recruited, including Canadian Ian Bazalgette VC DFC. Hamish also described during his visit to Nanton, that he had suffered, “174 cannon shells up his kilt.” on an Operation to Cologne on 1st Feb 1943. Despite terrifying moments in the skies over Enemy Territory and the regular loss of friends in the Squadron, Baz seems to have appreciated and even enjoyed his particular role in the War. In the last letter he wrote to his good friend Eric Biggs, with whom he served in the Searchlight Troupe in Scotland, Baz wrote, “Barring the occasional sticky effort, I feel that the RAF Fights very luxuriously. If ever I prayed sincerely, I did for the Army as we did our stuff on ‘D-Day.’ I am as happy as a bee with a bum full of honey these days. My Crew are a grand bunch, and I am serving with a really grand Squadron.” Squadron Leader Bazalgette’s Logbook ends, as so many sadly did, with the word “Missing” and the Signature of one of the Squadron’s Senior Officers. Chuck Godfrey remembered Ian’s dry sense of humour which made him one of the most popular members of the Mess. He also recalled Baz’s expertise in, “Doing the Muffin Man.” This feat involves placing a Pint of Beer on one’s Forehead while standing. The next step is to sit down and eventually to lie flat on your back, all the time of course, balancing the pint of beer on your forehead. If you are successful to this point, you simply have to regain the standing position. “Baz was a real expert at that,” recalled Chuck after demonstrating the Technique, without the pint of beer, in a videotaped interview for the Nanton Lancaster Society. The PFF crews thereafter found their way in the Force via varied Routes; Crews or Individuals could Volunteer at any time while serving with Main Force Squadrons, while Aircrew who showed promise in their Training could also find themselves seconded into the Force. Some Crews in Mid-Tour could also be transferred into PFF when numbers were needed to be made up to Establishment where required. Recruits were given a 2-week course in Marking Techniques at Warboys before posting to a Squadron. Bennett addressed each intake personally and the Crews came to have an intense sense of Loyalty, Pride & Professionalism in their membership of No.8 Group. The PFF Crews were also granted a Step-up in Rank, & Increase in Pay, but had to do a 45 Trip Tour rather than the usual 30 trips, for as long as they were serving in PFF. In the end, Harris was proved wrong about PFF’s effect on Morale – the Coveted PFF Badge allowed to be worn on their Uniforms was genuinely a sought-after achievement. At 1st the Task was carried out by an appointed Pathfinder in the 1st Wave of Target Markers. Flying initially a normal Lancaster Bomber, he would assess how accurate the Markers were and then, circle the Target, he would talk to the Incoming Bombers on Radio and correct their Bombing. Not a pleasant Task, as circling the Target would mean your Aircraft stood out from the Main Stream by its actions alone. This would allow Radar controlled Anti-aircraft guns to single this Aircraft out. From 1944 most Pathfinder Squadrons flew the wooden Mosquito Aircraft, thus were able to fly numerous Spoof Raids to different Targets to confuse the Night Defences, plus it made the Job of the Master Bomber a little safer as the Aircraft did not show up so well on the German Radars. It is said that a German Night Fighter Pilot shooting down a Mosquito, would be credited with 2 ‘Kills’ Which shows how annoying these Aircraft were to the Germans. Undoubtedly, anyone who flew a Bomber in WW2 was a brave man. To become a Pathfinder and ultimately a Master Bomber is well above the call of Normal Duty. F/Lt John William Peart Reader – The Officer in Charge and Chief Technical Officer of RAF Warboys and the Maintenance Wing Satellite Stations; which included 105, 109, 139 Squadrons, RAF Oakington & RAF Upwood, de Havilland Mosquitos; 83 & 97 Squadrons & Night Training Unit, RAF Wyton, Avro Lancasters; to 1946. He was the Station Entertainment Officer and Organised amongst other events a visit to Warboys by the RAF Squadronaires Orchestra. One Children’s Christmas Party on the Station when Group Captain Mahaddie came in and said he was going to start it by firing his Pistol which he was wearing as he was on Duty. No, he didn’t actually Fire it, he just waved it around. A bit like Captain Mainwaring of Dad’s Army. Mahaddie’s finest hour came in 1968 when he was recruited by Harry Saltzman to find as many WW2 Vintage Aircraft as possible for the Aviation Epic “Battle Of Britain“. The Producers had realised that with the Film being made in colour, using Wartime Footage & Models was not acceptable. Hamish Mahaddie managed to persuade the RAF to lend many of its Aircraft as Static Airfield Dressing and in addition to this found 9 Airworthy Spitfires and 3 Airworthy Hurricanes. Mahaddie’s Big Coup was finding the Spanish Air Force were still using licence built Heinkel 111 Bombers & Messerschmitt 109 Fighters, ironically with Rolls-Royce Engines. He persuaded the Spanish Air Force to co-operate in the Filming of “Battle Of Britain“. This enabled the Film to have its spectacular Dogfight Sequences, using real Aircraft in a real Sky, something that CGI effects cannot match. During the Filming of “Battle Of Britain“, Mahaddie lent his Mosquito Bomber to Mirisch for their Film “Mosquito Squadron“, a lame “Sequel” to “633 Squadron” that re-used many scenes from the earlier film. The Mosquito RS712 was eventually Sold by Mahaddie in 1972 and now resides in Florida, its Flying Days apparently over. Mahaddie was also Advisor to the short-lived British TV series “The Pathfinders“. After this, the trail goes cold, as related earlier Mahaddie did not detail the Films he was involved with in his Memoirs. Pathfinders is a 1970s ITV drama set in the WW2, telling the story of the fictitious Royal Air Force 192 Pathfinder Squadron. The Pathfinders were specialised RAF Squadrons that Marked Targets for the RAF’s Heavy Bombers. The series used Radio Controlled Avro Lancaster Models for the Flying Scenes. The Technical Adviser for the Series was Group Captain Hamish Mahaddie. Group Captain Hamish Mahaddie died on 16th January 1997.